Founded in 1956, Schiavone Construction Co. opened its doors as a small contracting operation with a focus on complex, fast track, heavy construction projects. Each year Schiavone has continued to grow steadily and widen its scope of activities with the type of work performed, and in the geographic area in which we operated, bidding in Canada and down the eastern coast to Virginia. From the start and continuing through today, we believed that the most important asset is our people. We work hard to establish a solid foundation of ambitious and dedicated construction workers, managers and engineers who were looking for a stable career with an exciting and flourishing organization. Over half a century later, Schiavone has now cultivated a new generation of leadership possessing the same confidence and discipline that has always been present. In today’s sophisticated technical culture, the people of Schiavone are still recognized for their ingenuity and expertise which makes each project an unqualified success. Schiavone Construction Co. was acquired by Dragados Inversiones USA, S.L. in December 2007, a subsidiary of Dragados, S.A. DRAGADOS is the construction arm of ACS Group, a leader in the industrial sector and in the Private-Public Partnership (PPP) industry, currently operating nearly one hundred rail, toll road, airport, and bridge concessions throughout the world. In December 2008, Schiavone Construction Co. changed its business form and merged with and into Schiavone Construction Co. LLC (Schiavone). While the firm’s ownership and official designation have changed, the engineering, estimating and operations talent pool that has made the Schiavone name synonymous with challenging, heavy construction projects in the Northeast remains intact and unchanged. Schiavone’s 50+ year commitment to deliver the highest quality construction services at the lowest possible cost is still the focus thanks to its stable core of proven construction professionals supported by a forward-thinking and visionary executive management team. Schiavone’s formula for success has made it one of the Northeast’s foremost construction companies, with contracts for tunnels, mass transit and subways, bridges and highways, deep foundations, marine work and water treatment plants, totaling over $7 billion. Bolstered by its greater financial strength and competitive edge, Schiavone is well-positioned to pursue even greater opportunities than ever before. We are an equal opportunity employer/ contractor and employ a diverse workforce. Schiavone was awarded the expansion of Carnegie Hall which involved construction of a new 40,100 square foot three-level concert hall beneath Carnegie Hall, while it was in full operation. The 109-year-old, 15 stories high, historic landmarked building is constructed of brick masonry. 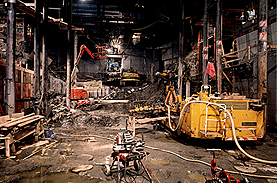 The building’s foundations are bearing on rock and in order to construct the hall, many different construction operations were utilized. 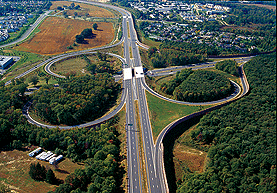 The Hightstown ByPass was the first Modified Design-Build project for Schiavone and the New Jersey Department of Transportation. Schiavone was responsible for the development of design, construction and documentation of Route 133. The 3.6 mile, four-lane roadway includes five grade-separated intersections, 13 bridges (six dual structures), noise walls and two retaining walls. This project was completed two years ahead of schedule at an overall savings of $10 million dollars.